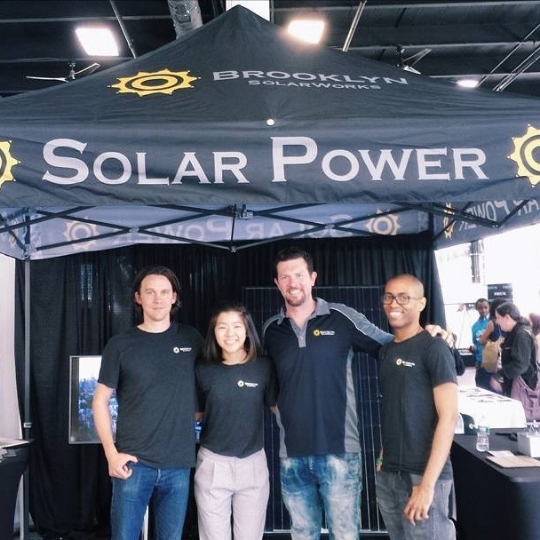 Brooklyn SolarWorks spent last weekend at the Northside Innovation Expo at Greenpoint’s Brooklyn Expo Center. What excited us more than sharing the spotlight with 50+ organizations of innovators and hackers was meeting those who shared our passion for solar or were even learning about it for the first time. We’re pretty proud of our setup, which featured solar-powered toy car and grasshopper demonstrations, free gear (hats, bags, postcards), and a DJ booth on the second day of the conference. Bicycle Utopia is a company that provides custom bike tours, combining art and bikes into one cultural NYC experience. EV-Box produces and supplies charging stations for electric vehicles and related cloud-based services. Indiegogo is a crowdfunding and fundraising platform helping individuals, groups, and non-profits raise money to make their ideas become a reality. NYCEDC (New York City Economic Development Corporation) is an NYC non-profit organization that promotes economic growth throughout the five boroughs. PivotDesk is an office-sharing marketplace connecting companies with extra office space with startups and small businesses. Urban Future Lab is an NYC hub for smart cities, smart grid, and clean energy located at the NYU Tandon School of Engineering. Always nice to meet others who aim to inspire and create a better world. If you met us at the expo, please feel free to reach out and say hi. We’d love to answer any questions you may have.